Flange nuts are nuts that has a wide flange at one end. 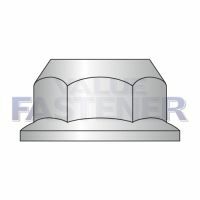 Value Fastener offers Flange Nuts with 2 choice, Serrated Flange Nuts or Non-Serrated Flange Nuts. The flange distributes pressure of the nut over the part being secured. This reduces the chance of damage to the part while making it less likely to loosen as a result of an uneven fastening surface.